Beijing has said Hong Kong can directly elect its leaders from 2017. Will they hold to the promise? On July 1, 1997, the British colony of Hong Kong was handed over to Chinese rule and became a Special Administrative Region (SAR) under the policy of “one country, two systems.” The SAR was promised “a high degree of autonomy” in running its own affairs, but defense and foreign affairs would be left to Beijing. Under “one country, two systems,” it was understood that the SAR would keep its capitalist system, while the people would enjoy the free lifestyles and be protected by the rule of law that existed before the handover. All of these provisions and more are stated in Hong Kong’s Basic Law, the SAR’s mini-constitution. Under colonial rule, the Hong Kong people were not allowed to elect their government. Instead, the colonial governor was appointed by the British government. Starting in 1997, Hong Kong’s chief executive has been elected by a committee that originally comprised 400 worthies drawn from pro-Beijing business, professional and political circles. In March 2012, Leung Chun-ying (commonly known as CY Leung) was elected chief executive by the committee—which now has 1,200 people. He won with 689 votes. Meanwhile, the legislative council elected in September 2012 has 70 members. Of these, half were elected on a one-person, one-vote basis and the other half were elected by so-called functional constituencies comprising banks, insurance companies, chambers of commerce, doctors, nurses, lawyers, architects, engineers and teachers. Voters in these elitist constituencies have an extra vote and thus the system is grossly unfair. For many years, the people of Hong Kong have demanded the right to elect the chief executive and all members of the legislative council by universal and equal suffrage. However, all attempts have been rebuffed by an unholy alliance between Beijing and the tycoons. 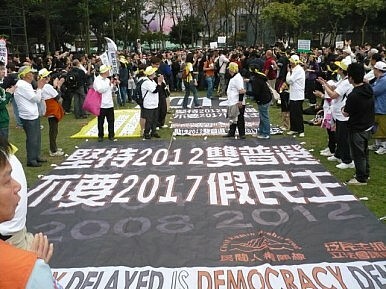 On July 1, 2003, between 500,000 and 700,000 people took to the streets to demand democracy and protest the government’s attempt to pass article 23 of Hong Kong’s Basic Law, which relates to national security. The huge protest was sparked by concerns that the new legislation would criminalize free speech and would undermine the rule of law. When legislative council members from the pro-Beijing Liberal Party withdrew their support, then Chief Executive CH Tung abandoned the bill. To date, it has not been resurrected. On March 12 and 13, 2013, the United Nations Human Rights Committee held hearings in Geneva on the SAR Government’s implementation of the International Covenant on Civil and Political Rights (ICCPR). The People’s Republic of China signed the ICCPR in October 1998 but the National People’s Congress, China’s rubber stamp parliament, has still not ratified it. Hence the reason China’s human rights record is not subjected to the scrutiny of the Human Rights Committee. During Hong Kong’s change of sovereignty in 1997, China agreed to allow Hong Kong to remain a party to the ICCPR. Similar permission was also given to the Macau SAR. This arrangement allowed the Hong Kong and Macau governments to send their own delegations to the UN Human Rights Committee hearings. I also attended the hearing in Geneva in March as an observer and lobbied the Human Rights Committee. The first time I attended the Committee’s hearing was a quarter of a century ago. I was working as a journalist for the Far Eastern Economic Review and learned by accident that a UN hearing on Hong Kong would be held in Geneva. I got hold of the government report, wrote down our criticisms and suggestions and flew to Geneva with a dozen people to lobby the committee. Twenty five years later today, Hong Kong still does not have democracy and the “one country, two systems” policy is at risk. I told the committee that more than 15 years after the handover, the Chinese government appeared to be losing patience with the idea of “one country, two systems” and was no longer prepared to exercise self restraint. Given the size of China compared with tiny Hong Kong, the “one country, two systems” ideal can only succeed if China decides to leave Hong Kong alone. However, in the past few years, Mainland officials have interfered in many aspects of Hong Kong life, particularly in its elections. They have helped pick candidates and plan strategy. They have even organized voters to return from the Mainland to vote on polling days. Despite these efforts, pro-Beijing candidates still polled fewer votes than pro-democracy candidates in the legislative council election held last September. Mainland officials have also suggested that there should be two centers of power in Hong Kong: one for SAR authorities and another for Mainland authorities. They have interfered with the work of the news media, university academics, business and professional people. Since many Hong Kong people have to work or do business in the Mainland, they are reluctant to say or do things that could upset Mainland officials. This has led many people to exercise self censorship and refrain from speaking their minds. For more than two decades, myself and many members of my party and others from the pro-democracy lobby were not allowed to travel to Mainland China. No reason has ever been given for banning us. But it is obvious that Beijing wanted to set an example and silence other critics and troublemakers – “killing the chickens to scare the monkeys,” as the Chinese proverb goes. In 2010, the legislative council passed a bill on the 2012 elections for Hong Kong’s chief executive and the legislative council. It did not provide for universal suffrage but was a small step forward. The Democratic Party supported the bill because it would break the impasse and pave the way for universal suffrage. With arrangements for the 2012 elections in place, Beijing indicated that the chief executive would be directly elected in 2017, after which all members of the legislative council would also be directly elected. However, there are still signs that Beijing does not wish to keep its promise for fear of losing control. I told the committee that a law professor at the University of Hong Kong suggested rallying 10,000 people to take over the business district in Central if the proposal for the direct election of the chief executive amounts to anything less than genuine universal suffrage. This suggestion shows how fed up and unhappy many in Hong Kong have become. I hope the Human Rights Committee will tell the SAR government to start consulting with Hong Kong’s people on the elections for the chief executive and legislative council, and keep its promise to implement universal suffrage. It is also my hope that the committee will tell the Chinese government to abide by its promise to uphold the policy of “one country, two systems” and refrain from meddling in the SAR’s internal affairs. It is clear that many Hong Kong people want democracy. They cherish their freedoms and the rule of law. I do not think they will idly stand by and allow the system to be quashed. Blocking traffic in Central would be a daring move; an act of civil disobedience that people would only resort to if there is no alternative. As for whether it will reach that point or not, the decision rests with Beijing. Emily Lau is a Democratic Party Legislative Council Member in the New Territories East district of Hong Kong. Hong Kong: Two Systems, One Country?Hong Kong's Voice of DiscontentHong Kong Chief Executive Meddled With Investigation of Secret PaymentsChina Celebrates 27th Anniversary of Hong Kong Basic Law With ThreatsHong Kong’s Democrats and the Chief Executive Election: Selecting a Lesser Evil?